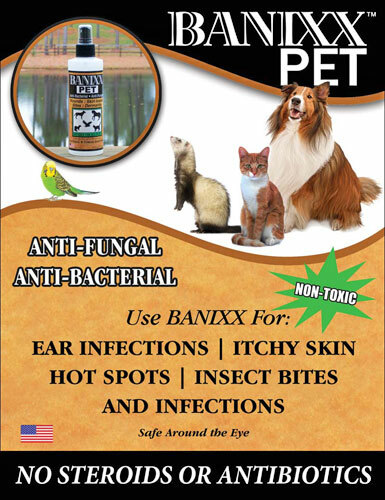 Banixx is an affordable multi-use spray for wounds, infections, dog ear infections, cuts, punctures, ring worm, dog hot spots, dog itchy skin and more. Banixx is an affordable multi-use spray for wounds, infections, dog ear infections, cuts, punctures, ring worm, dog hot spots, dog itchy skin and more. Test results show a 99.9999% kill rate for the big three bacteria - staphylococcus, salmonella and pseudomonas. Banix helps dogs naturally recover from bacterial and fungal infections on their own while promoting deep tissue healing. It contains 2.5% hydronium solution and is clinically proven safe around the eye. It does not contain steroids or antibiotics and will not burn infected tissue, stain, or irritate skin, and it has no offensive odor. All temperature-tolerant, with a long shelf life Banixx is suitable for all pets. How Do I Know If My Dog’s Itchy Ears Are Due To Bacteria or Fungus? Ear infections in dogs are at the top of the list for visits to the vet! Ear infections can be either bacterial or fungal, though yeast is the most common cause of fungal ear infections in dogs. All dogs have yeast and bacteria present in their ears; however, if their immune system is compromised in some way, populations of these two microorganisms can grow out of control. Your vet can make a quick diagnostic test to determine what type of infection your dog has. Bacterial infections in the ear are either pathogenic, picked up from an outside source, such as pond water, or nonpathogenic, such as staph, which is naturally occurring in the body. Fungal infections can also develop into secondary bacterial infections, which is why double-duty Banixx (anti-fungal & anti-bacterial) is such a winning solution for ear infections in dogs. If the infection does not respond to treatment, consultation with a veterinarian is advised. How Often Should I Treat My Dog’s Ears? For ear infections in dogs, Banixx should be applied 2-3 times daily until the infection has cleared up. For dogs that are prone to infections, Banixx can be used on a regular basis as a preventative measure. The best method for application is to saturate a cotton ball and gently moisten the inside of the ear canal. Banixx must make good contact with the infected area to be effective, so be sure that the inside of the ear is thoroughly moistened. Never use cotton swabs (Q-Tips) except to clean the outer ear. Another method for cleaning the ear is to squirt a small amount of Banixx solution directly into the ear and then gently apply a cotton ball to the ear. This method is generally less desirable because your dog will likely fling his head to rid himself of the liquid, covering you and your surroundings! A regular cleaning of your dog’s ears with Banixx — especially after swimming or other particularly dirty activities — may make your dog less likely to contract ear infections. What Do Dog Owners Say About Banixx? My dog, Ms Gibson, suffered from horrendous allergies. She chewed and bit her paws until they were bloody. It did not happen in one day, but she stopped chewing and biting after a few days and after a couple of weeks, baby hair started to re-grow. I now use it every couple of weeks as a preventative. I just came back from a Dog Show and found my Golden’s face was covered in a big, stinky hot spot. As soon as I applied Banixx to it the itching was reduced and, a few hours later, the stench was gone. It is now healing well. My veterinarian is very interested to try it! We get in many rescues with horrendous ear problems and severe Demodex. The case of Sunshine comes to mind. She was such a mess; Banixx was an instant soothing, healing agent for her and she made a tremendous recovery in record time…she then found a loving, forever home! I love that there is something so affordable and so safe for my dog…I love its long shelf life and that I can take it anywhere in my car with me without worrying about it losing its potency despite temperature extremes! Safe for the environment, safe for my dog and easy on the pocket book….what’s not to like? Nancy W from Richmond, IL. Order Banixx For Your Dog Today! Treat ear infections in dogs, dog hot spots and dog itchy skin safely, affordably and effectively with Banixx! Banixx is available at numerous on-line and print catalogs such as HorseHealth, Jeffers Pet KV Vet, and Valley Vet. You can also go online to Banixx.com to search for a retailer near you that carries it, or purchase it directly from the website.